Compared to MacJournal for Mac, this piece of software is an ugly kludge. The most irritating thing is that it stops your work every few seconds to show a “loading” icon. I tried to report this as a bug, but the resulting screen wouldn’t let me paste in my password to log in, so I gave up. The app stopped syncing, it does not recognize other than the ipad it lives in! So frustrating! It used to be such a great app! Also, it is very annoying that it does not open in a new note, it always needs to start from an existing one. Why, oh why??? Terrible app. Was looking for something other than Day One that would sync with a MacPro, but this app just doesn't cut it. Pictures are not resized to fit a screen, so you can only view a part of the picture in your entry. There is not even a scroll for the picture. Definately Not user friendly app. I bought the Mac version of this years ago and kept losing my journals! Then I thought well, one more try... I got the iOS version and when it synced I lost everything again! It's never worked right! Any version will lose your journals and you'll never get them back. No matter what the settings are... Run away! I've used Mac journal off and on for years on my MacBook Pro but recently started wanting to use a diary/journal on my iPad. I read all these reviews and wondered what had happened to this company, did it fall into mismanagement? After a while I decided to spend the $1.99 and just try the iPad version for myself. Sync worked after I took down firewall and changes made on either device are updated to the other device. Not sure what people are complaining about here but this has been and still is a great application. Love the fact that I can use a familiar app and that syncing between my MBP and iPad is easy. For the business stuff I'll use the MBP but for the dailies I can now do those EOD on my iPad. Well done and thank you. Glad I got over the bad reviews. I have been using MacJournal on my Macs for several years and I like the program. 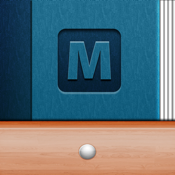 It is the most polished of all the journaling apps around. Unfortunately, I have recently lost several entries. If I add text to a day's entry on the iPad and then close the program and then open MacJournal again, the newly entered text has disappeared. Apparently, MacJournal had not synced with Dropbox (my cloud server). So when I reopened MacJournal it downloaded what was on Dropbox, which did not include the latest text entry. Day One does not have this problem. You can even manually sync with Dropbox. So I have decided to switch completely to Day One. I am sad because I really liked MacJournal. Unless you want to start over and not view old Journals this app has become worthless. When you go to sync via iCloud it won't show what is already available so you have to create a new journal. No good if you are using on your iPhone and iPad. Until they come up with a reasonable fix I wouldn't purchase this. Day One is much better at keeping synced and you can import old journals very easily. Sad because I really enjoyed this app till now. Check for iOS 7... It's not work. I like this app interface. But it is not work ios7. Please check it. First this app has a good interface and the Dropbox sync mostly works. I would rate this a 3 except for one thing. If they updated it more frequently with meaningful updates that add features that they are missing, like include sync it would be a for or even a five. The reason that I give it a two and why I say that Dropbox sync mostly works is that when you are offline don't do any journal entries. The offline editing does not work at best and at worst it will lose entries from your journal. I have worked with support on this for years. They say it's getting better but that Dropbox is the problem. But I have another app that uses Dropbox sync and they have never had an issue. So as long as you use it online only. Make sure that it syncs completely. And, make frequent backups of your data upside their backup system then it works great. If you don't you risk losing data. In the year 2016 it should just be a given that all my devices are always in sync with one another. That I have to manually initiate sync, and that I have to be on the same wifi network with the devices I want to sync, should be a thing of the the past. I understand that apple's cloud service was a mess when it first got introduced. But all my other apps are using it now. And it works perfectly for them. So, until they bring the automatic sync feature across all devices via iCloud to macjournal, I can give this app 1 star only. After several attempts, it looks like I’ve managed to get MacJournal for the iPad syncing with my Mac version through DropBox. The whole process is far from intuitive and, potentially, quite dangerous. There is little in the way of instructions in the app itself and the material on the Mariner web site is far from clear and not entirely up to date. The bottom line is that no one should attempt to link via DropBox unless they are (1) running TimeMachine and (2) know how to use it to restore deleted files (I had to recover a decade of notes that were deleted in one of my attempts). You will also need to make sure that you Mac copy remains pointed to the copy of the MacJournal file on DropBox (mine seems, at one point, to have moved into "Application Support" in the library). MacJournal for the Mac is a decent enough journaling program (it has stiff competition from newer programs, though). MacJournal for the iPad remains a work in progress (and, I suspect, will remain so for a long time) and it not obviously preferable to any number of newer IOS journaling programs that have been able to handle syncing with the Mac much more easily and without the same potential of data loss. But the real hero of my MacJournal adventure is TimeMachine. It is terrific! Still struggling. They have not figured out syncing. I reviewed a previous version some time last year. The problems persist. This software is still just not there. The MacJournal for the Mac is fantastic, but they cannot seem to figure out how to make data sync. With the latest version, I am constantly losing data (!) after syncing between my Mac and iPad. Bugs are to be expected, but lost data is simply not acceptable. Sadly, as much as love the platform on my Mac, I’m going to have to find another solution/program with some developers who can handle syncing. This one is just far too frustrating - fails more often than it succeeds. After many years using MacJournal on my Macs, I was expecting at least a fraction of the MacJournal experience. This app is a plain piece of crap. I wonder what is happening at Mariner to dare putting such app for sale. I wish I could have my money back. Shame on you folks. Today's iPad update of MacJournal is flawed. The synch feature which used to work admirably is now stuck in an endless loop. Fortunately, it did not seem to corrupt my main journal but you may not be so lucky. The iPad version of my journals has the titles but no contest for the entries. The circle keeps spinning like it's loading then it crashes! Haven't we seen this movie before from Mariner? Get it together, please! Skip this update and stick with the very usable prior version. Within the app itself, this version is listed as ver. 1.7 BETA. I am not into beta testing an app I already paid for. Come on, folks. You gotta do better than that. Not cool. As for this version (1.7 BETA-- I just can't say it enough--BETA): Beginning with the hard-to-look-at lime green UI, which you can't change (Really? How hard would the ability to pick another color be to implement? ), this BETA update is a disappointment. The fixes will come, hopefully, and there is some promise here. But, the bulk of the update involves a poorly thought out iOS 7 implementation and some major fumbling of the sync capabilities. In the meanwhile, I will be recovering the old version from my iTunes backup. The app works well but is a bit uncomfortable and not well formated for ipad. Cannot have a full screen to write on. Always has history of previous notes on the screen. This version broke Dropbox support. It is simply hanging and doing nothing. Not even access to setting, most icons is missing. Recall this version! Really love this journal. It works beautifully with the Ira Progoff Intensive Journal method. I downloaded the app and set up a password and hit the home button. I then relaunched the app but no password screen. I then restarted the iPad and relaunched the app, this time the password screen came up and I entered the password and the app opened to my first entry. Next I hit the home button and the relaunched this time app opened without the need for password. Hit home button again go back to main screen and then hit home button twice slide up all background apps. Relaunch MacJournal, password screen come up, instead of entering password hit home button and then relaunch app, this time app opens without need for password. Not Good. Password works correctly on my iPhone and Mac versions of MacJournal, please fix the iPad MacJournal password code. Thank you. I purchased the Journal for Mac App and it is a great program. I did purchase this so I could sync with my iPad. This doesn't work - the developer tried to give me help on how to make the sync possible but to no avail I try each day to see if, perhaps I can get this thing to sync with my Mac but, alas, no luck. I keep getting the message "It seems the connection is taking longer than usual and you might want to disable any firewalls." I disable the fire wall and get the same message. Well, I'm stuck with this thing on my iPad but you don't have to be. Just check reviews and if this problem is solved, then fine, go ahead and spend the money otherwise, stick with Day One on you iPad or iPhone. Having used a previous journalling app that was abandoned by the developer (viJournal), I was looking for something that can handle multiple journals and sync easily. This is perfect for my needs. Having to transfer over 1000 entries to this app has been much easier than anticipated. I love the labelling and tagging features, as well as the ease of use. Sync performance has been excellent, too! The latest update broke my Dropbox sync. Can’t access the journal list, and pretty much made the program unusable. Why is the program getting worse, not better with updates? MacJournal syncing doesn't work for iPad Pro. I’ve been using MacJournal on my two Macs for over a year now and I bought the mobile version a couple months ago. So far I’ve been very happy with it. Although I use it primarily to sync to my journals on my Macs, it certainly has enough features to function as a stand-alone app. You can have multiple journals, smart journals, and password protected journals (at least that is what I have used it for). I sync over WiFi and one major drawback is that the sync process is quite slow. I haven’t had any lost data or other catastrophes, but it is just quite slow. I also sync the program on my Macs and that also is quite slow, so it might just be the way they have structured their database. So I can’t understand all the bad reviews posted earlier. The Mac application is great, by the way, and the only drawback I’ve noticed in the iPad app is that syncing isn’t that brisk. I'd almost consider giving it five stars but four stars probably fits it best. This is very nearly my ideal go-to app for all kinds of notes and rtf files and for keeping them organized and synced. The "nearly" is necessary since there seem to be ongoing and somewhat mysterious sync difficulties for some users (including me). When these difficulties are fully and finally resolved I will gladly give the app five stars. Until then I am afraid to trust it to keep and sync my data reliably. This app is a scam. I just paid $5 for it and it doesn't even start effectively let alone load or synch my journals. I am very disappointed and I want my $5 back! Apple should review and test apps that they sell so this does not happen! DON'T BUY! I cannot say how much I loath this app and its sister app on my Mac. I've been using it for a number of years. Mostly because I paid buckets of cash for both of them and so kept hanging on. I have lost all my data more than once. I had backed it up to Journler so was able to recover all but bout 6 months out of the 9 years worth of journals I lost. What prompted me to write a review today? When I opened a journal on my iPad an found my way to the single most important document on my iPad the entry was blank. Blank. There is no way I just erased the info. Then, I couldn't get it to find my Mac, not uncommon, actually. I have lost a month's worth of critical data. The entry on my Mac synced, but the document was still blank. I had to push it through iTunes as a pages doc then cut and paste. I am cutting my losses with this app and moving on. I cannot stress enough not to buy this app. If I could remove stars and give it a -5 I would. I would go back to a paper journal if I had to keep using this pos. and their customer service is miserable. I love the Mac version of this program so I decided to get this as a companion. I try to copy-paste something into an entry, then tag it and it crashes, losing everything. I'll update my review when problems like this are solved but for now, avoid. Years ago, I purchased the Mac and later iOS version of this app. Things were fine, til sync became a required feature. Fortunately, the pain died when a new, responsive dev appeared, giving us DayOne. Mariner has taught me one thing, with a vengeance: avoid ALL apps from this company - just a complete & consistent pain in the skleeboop. I had to remove it from my iPad... It won't move, frozen, deep frozen, what a shame..
Best Journal App for Macintosh and iOS ever! Being completely objective-C one, seen them all? Not quite: MacJournal on one any one Mac works so well with everything Mac OS X and iOS has to offer, plus across all your Apple Mac's and iOS iPhones and iPads, makes for a seamless, coherent experience. Never out of sync with each other, multiple categories, types of media, sharing, and exporting, multiple journals, Etc. It just keeps up, growing with the system, and stays simple, elegant, and easy to use. A true gem in the Sea of Joys. High recommend to any and all. I would not recommend this app. I had created about one month's worth of journal entries when suddenly the password wizard froze and I could no longer gain entry to the app. I was able to restore my journal entries only by opening the backed up database through iTunes file sharing. I deleted the app and then reloaded it, just for experimental purposes, but without using a password and without making entries of any significance. The app froze once again, and I kind of gave up on it at that point. About one month later I reinstalled the app just to see what might happen, created a journal, but could not even make an entry: the entry wizard just gave out as I was trying to make a choice. It is too bad about this, because MacJournal for Mac is a great app, and having these companion apps was a big help. I like the macjournal for my MacBook well enough, and have used it for years. I thought, how great, now that I have an ipad I'll have access to all the stuff I've saved in MacJournal while on the go. Except....I don't. First, this was not easy to sync between my MacBook and the Ipad, though I finally was able to do it with drop box. Second, not everything synced. Supposedly, you can't add images in the ipad version, but if they are in the orginal journal entries, you'll be able to see them on the Ipad. Except you can't. A lot of stuff I had is now simply not usable on the ipad. And Mariner's "help" info on the website is useless. Don't bother with this app. I should have just stuck to Evernote and not even attempted to get this. It's not quite useless....but it's close. Update corrupted my journal and I lost all my writing from the last time I synced. Tech support is TERRIBLE. Two curt emails which yielded nothing. Then no response to 4 additional emails. No number to call. Bad way to do business. Use this ap at your own risk. It's 2017 I bought the MacJournal for my Mac first and waited in the IPad version. The iPad shows ICloud capabilities but the Mac version doesn't? I've tried adding the folder to my shared iCloud Drive but no success. Can't find any info in the user guide either. I love the software I just wanna be able to carry it where ever I go. Including my iPhone. Please make it just a little better, and simple. The desktop has been a stellar performer for years and years. I wanted this to work so I tried and tried and tried. Now I am tired tired tired. Doesn't sync properly, slow and inconsistent performance and horrible interface that is not intuitive at all. The biggest surprise with the iPad version is that they are still selling it. The new cartoon crayon flat interface is a horrible change. Please change back to the old interface. I really want to like this app as much as I like the Mac version, but I lose so many entries that I've just given up on it. It isn't worth it even if you have MacJournal on your Mac. Just download a more reliable text editor--There are many that come with password features--and copy and paste those entries to your Mac. Kind of a hassle, but at least it'll survive! Completely removed and reinstalled, same behavior -- open the app, it flashes briefly into the screen, then vanishes. I foolishly bought this app a long time ago and whenever I notice an update I always reinstall to see if it's finally usable. Generally it's only disappointing rather than completely broken, however. So much wasted potential. I agree with the previous comments. I've just lost years of journals...even though I did all the right things by asking MacJournal to sync with iCloud. I am very very upset. Those journals meant a lot to me. DO NOT UPDATE TO THIS VERSION! I accepted the recent update. And, like others I regret it. The iPad and iPhone versions just hang and cannot read any data. Fortunately, all my entries are intact on my desktop version. This product has had its ups and downs over the years. My suggestion is that the developer use more thorough, robust testing because some of these bugs should never be present once they hit the App Store. I am beginning to wonder if anyone tests this app before they release an update. It has never worked well, but this last update is a disaster. After several attempts at syncing, I finally got it to work, but the sync went so fast I wondered if my data was going to be corrupt. I was particularly concerned with one entry that was quite large with numerous images. It turned out a jumbled up mess with images just thrown all over the place, not in order, blank boxes obscuring text, and finally, nothing at all on the bottom but a few characters and partial characters that looked as though invisible images were covering them up. At this point I think I am ready to turn my crucial entries into pdf files and abandoned macjournal completely. I'm afraid to use the sync feature in case it ends up scrambling my very carefully formatted entries on my desktop, or even worse, losing them all together. This app has been around for several years and it has been buggy and messed up all along. It cannot sync with the Mac version without major problems using any syncing methods, it randomly loses your entries and the developer seems totally clueless as to what is wrong. It started out a buggy, crap app and remains very much so in the latest version. I would give it minus stars if that were allowed. All the bad reviews are true and then some. This developer should be booted off the app store. And it does work well and does synch well, but carefully follow the directions. A small caveat, not for this app as such: But If you also have a program called CleanMyMac, be very careful. That program can destroy data with abandon, including MacJournal data. But an update of this review is in order as of 9/15/15: my faithful MacJournal app has suddenly frozen and I don't know what to do about it. I can delete it and download it again, but will lose all my data. The Mariner website, in common with many developer websites, offers no help at all. So, as we all probably know, store important data on multiple apps, for no one is wholly reliable. My favorite, MacJournal, just proved my point! Despite some problematic reviews I just downloaded MacJournal for iPad and am putting it through its paces. Only glitch so far: The app crashed when I was in "settings" and tried to use the Passcode Lock. But it recovered with no data loss. I'm a longtime user of the desktop version and find it valuable for personal and professional writing. Syncing between the desktop and iPad is important to me, and MacJournal for iPad performed flawlessly on a standard home WiFi network. We'll see how this app performs in the longer term, but so far I'm very happy with the look, feel and functionality. I generally like this mobile app and would like to give it more stars. It has good interface with one exception. The search feature controls do not appear to display correctly. The search options are overlapped by the Cancel button so you cannot select the search scope. Also, entered search text does not produce results, despite the text string being available in a majority of entries. This journal app hasn't changed very much in a few years & could stand a dusting at very least, but it works well to create individually designated journals, can password protect them, albeit not robustly. The journals exist locally INSTEAD of the ugly subscription trend going around in software these days! (sort of like official ransomware, but that is offtopic). Using MacJournal for example, you can create a daily journal, a vacation or medical symptom tracker journal, for sporting records, a journal for wild hair book projects on-the-fly & tag them by criteria off your own choosing. Haven't looked lately, but there wasn't much competition for MacJournal to recommend over this.